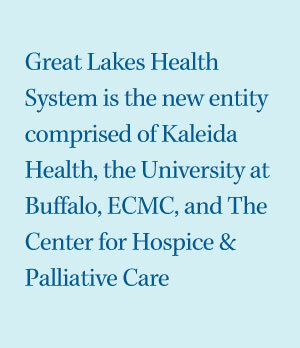 Great Lakes Health System is the entity comprised of Kaleida Health, the University at Buffalo, ECMC and The Center for Hospice & Palliative Care. We're honored to be the largest healthcare network in Western New York, and are committed to providing the area with highly skilled doctors and nurses, state-of-the-art equipment, cutting-edge research and superior facilities. To deliver the very best care for all our patients, we focus on a collaborative and efficient approach. Please keep visiting this site to hear more about our dedication to improved health care for the Western New York community. To see Great Lakes Health System in action, watch our 2-minute video.